ASRock has released its Phantom Gaming 6 motherboard. It supports X399 Threadripper CPUs, up to 128GB of 3400MHz OC DDR4 RAM, Phantom Gaming 2.5G and Intel Gigabit LAN. It also has 7.1 channel audio, 3 PCI-e 3.0 x16 slots, 3 M.2 slots and, of course, RGB. 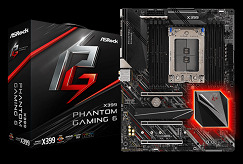 ASRock has launched its first iteration of a X399 (TR4 socket) Phantom Gaming 6 board for Threadripper CPUs. It has 4 slots that support a maximum of 128GB DDR4 3400MHz OC0able RAM. This HEDT variant of the company's new line-up supports both NVIDIA 3-Way SLI and AMD 3-Way CrossFireX. This product also offers Phantom Gaming 2.5G and Intel Gigabit LAN. It also has 2 10Gbps second-gen USB 3.1 ports, one of which is Type-C. It also has a total of 12 type-A first-gen USB 3.1 ports, and 1 S/PDIF port. The Phantom Gaming 6 board also has 7.1 channel audio with Creative Sound Blaster Cinema 5. In terms of expansion options, it has 8 SATA3s, 3 PCI-e 3.0 x16 and the same number of M.2 slots. The Phantom Gaming 6 also has an "XXL" aluminum-alloy heatsink and a matte-black PCB. Presumably, this sets off the polychromic, syncable RGB lighting off quite well. The high end-targeting ASRock Phantom Gaming 6 motherboard has a price-tag to match this aspiration: US$440. Therefore, it may be something for the Xmas list, then.